What lovely motifs and colors!! It looks so pretty this far. And does the hoop really help on WDW! I'm not crazy about that linen, but maybe the hoop would help stretch the whole a little bit. I have a hard time seeing them on that fabric. Lovely start! So nice soft colors! I'm really liking your new start, Nicole! The colours are so pretty! Interesting to read that about WDW linen. I haven't tried 40 ct yet though. Oooh, so pretty! Lovely start! Beautiful beginning! The colors are so pretty! That's a sweet start Nicole - love the colours! That is absolutely beautiful! Funny, but we were talking on Sat. in the shop about the softness of WDW linens, and one of the customers, a very experienced needleworker, said she sprays spray starch on WDW to stiffen them up. Love their colors though--very worth it. I was just thinking about you last night as stitching Ann Grant, then look at you are starting a new one! Another pretty one!! Love the start, will enjoy watching it grow. Great start...just love the colors. Oh such pretty colors - I really like this one! I always stitch in hand and have never used WDW but I have to admit I prefer the stiffer fabric. If the colors are any indication your pieces will be yummy :-) Can't wait to see it finished. Oh it's so pretty!!!! Now I want to start mine, LOL. Very nice start. Love the colors. I have been obsessing about this pattern! Even bought the Belle Soie threads while I'm waiting for the pattern to arrive. I look forward to seeing yours progressing! Wonderful colors!! I am anxious to watch your progress on this one. Nicole, you are right. The colors in Milicent are so pretty! I know you'll enjoy stitching it. What a good start! 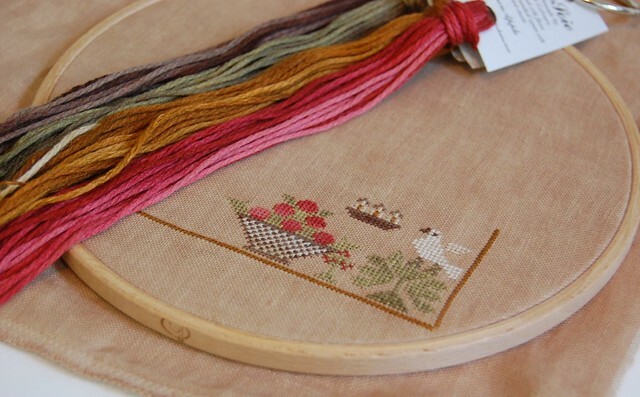 The colors are lovely, and your stitching is making it look great! It looks so pretty already, can't wait to see more! Happy stitching to you. Gorgeous start! I really love the colors. Now I think I may have to have this chart sooner rather than later! Great start, love the colors. Those colors look GREAT! I miss stitching with pinks/reds. I need to pull out one of my projects that uses that thread. I love your blog and I love your works .. I am Italian and I don't speak English very well .. I'm glad to have you discovered .. your works are wonderful!